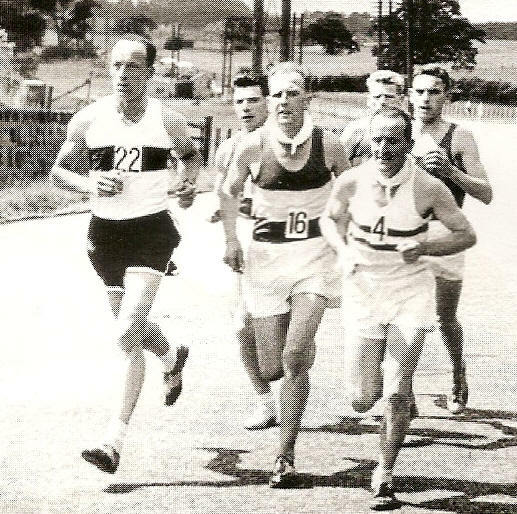 John Kerr (second from left, head showing between George King and Andy Fleming) in the 1957 SAAA Marathon. John Millar Kerr, who between 1960 and 1962 won one gold medal and two silver medals in the Scottish Marathon Championships, ran for the Harriers in Airdrie, his birthplace in 1933. He had been a cyclist and was known as ‘Jack’ to his fellow bikers although his mother disapproved of the abbreviation. Hugh Mitchell (Shettleston) twice a silver medallist (in 1964 and 1969) and a record breaker in the solo Edinburgh to Glasgow was another one of those cyclists and remembers that John had a low but very powerful running action. Jackie Foster (who won a bronze medal in 1959) remembers him as ‘Johnny’ Kerr, and rather ‘fat’ for a runner, probably weighing over eleven stones compared to the nine and a half of normal ‘scraggy’ competitors. However his wonderfully positive attitude made him state that his extra weight was an advantage as he had something to lose, unlike ‘skinny rabbits’ like Jackie himself! Johnny had a low shuffling stride and sweated profusely appearing to stretch his vest and nylon running shorts to the maximum. When Jackie worried once about an apparently classy field of opponents, Johnny retorted “Nonsense. They have just two legs each like you and I,” and went on to win. One day the two of them were running in the Strathallan twenty miler on a red hot day with black bubbles of tar forming on the road. They had broken away from the field at fifteen miles and Jackie was highly chuffed at still keeping up with Johnny and was looking forward to finishing second. With about half a mile still to go, Jackie offered his rival one of the little refresher sweets he was carrying. Johnny Kerr stopped still immediately and Jackie carried onto the track to win in two hours two minutes. When Johynny did come on to the track a full five minutes later, he took off his peaked cap and jumped on it! He told Jackie later that he could not believe him fresh enough to offer him sweets after such a gruelling run. So, for once, Johnny’s strong self-confidence was broken – although Jackie never beat him again. Johnny Kerr tended to race himself fit, starting in March. By June 1956, running for Monkland Harriers, he had finished second in both the Dundee 13 and the Babcock and Wilcox 15 – and had joined the Scottish Marathon Club. He raced frequently – up to 18 miles – and was a meritorious fifth in the Scottish Marathon Club overall championship that year. In 1957, now representing Airdrie Harriers, he won the Springburn 12 on 25th May, defeating Hugo Fox, and a week later the Dundee Corporation 13. However when he made his debut in the SAAA Marathon on 22nd June he found the extra distance hard and dropped back to finish eleventh in 2:20:56 (but inside the standard time of 2:55:00) Undaunted he continued to race frequently and sheer consistency enabled him to win the SMC overall championship, pipping the first two in the SAAA Marathon, Harry Fenion and Hugo Fox. In 1958 he disappeared form the results sheets, perhaps because of injury. However in 1959 he tried again finishing thi9rd in the Edinburgh to North Berwick 22.6 , before improving to fifth in the SAAA Marathon in a new personal best of 2:45:40, well inside the new 2:50 standard time. On the 18th July he won the Kilwinning 10 in 52:25 beating Motherwell YMCA’s Tom Scott.A week later John was victorious in the Gourock Highland Games 14. he finished fourth in the SMC overall championship for the McNamara Cup. In 1960 he improved to second in the Edinburgh to North Berwick in May. That year’s Scottish Marathon finishing at Old Meadowbank Stadium in Edinburgh, took place on another particularly hot, sunny day. Gordon Eadie of Cambuslang Harriers, a durable athlete who represented Scotland in the International Cross Country Championships in 1961, broke the solo Edinburgh to Glasgow race, won another two marathon medals – silver in 1959 and 1966 – started cautiously and ran an even paced race, making steady progress and passing the leaders in the later miles to win convincingly in 2:36:40 from Johnny Kerr (2:40:55) and Charlie Fraser of Edinburgh Southern Harriers (2:41:26). At the end of the 1961 season he was named Scottish Road Runner of the Year and awarded the Donald McNab Robertson Memorial Trophy. When the Scottish marathon took place on 23rd June, 1962, a new course was devised although it did finish for the last time on the ash track of the so-called New Meadowbank Stadium in Edinburgh. The race started outside the Stadium, went towards Dalkeith, worked its way back towards the coast through Cockenzie and so back into Edinburgh. Although John Kerr did manage to revenge his earlier defeat by Andy Brown he had a new star to contend with – the illustrious Alastair Wood (Aberdeen AAC) who went on to be fourth in the European Marathon Championships in Belgrade that year. Wood remembered the Scottish course as being very hilly with a headwind on the way back. He battled with Andy Brown and John Kerr before breaking away at 18 miles. Eventually a tired Alastair Wood broke the Championship record in 2:24:59. Johnny Kerr of Airdrie Harriers was second, once again in the very good time of 2:26:58 and Charlie Fraser (ESH) was third in 2:30:05. By the end of the season John Kerr had won the SMC overall championship easily in front of worthy opponents such as Andy Brown and Gordon Eadie. In 1963 however John Kerr’s previous good form deserted him. After his usual third place in the Clydebank to Helensburgh, he could only manage seventh, a disappointing 19 minutes behind Jim Alder in teh Edinburgh to North Berwick Road Race; it seems likely that he retired from athletics soon after that to concentrate on coaching. 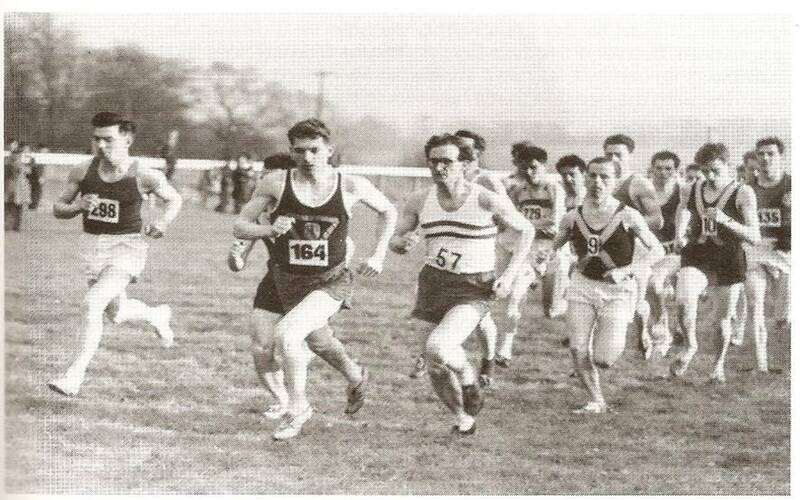 He was a Committee Member of the Scottish Marathon Club from 1963 to 1968. Johnny’s widow put up a memorial trophy which for many years went to the winner of the Airdrie 13. Nowadays it is presented to the winner of the popular Monklands Half Marathon. As a young(ish) road runner myself in 1961 I followed the SAAA Marathon Championship from Falkirk to Edinburgh in Jimmy Scott’s minibus and it was a good race to watch with Ian Harris and John leading the field – Ian was said to be a PE Instructor in the Parachute regiment; he was said to run to work in the morning, do PE all day and run home again at night and in general he was built up as the favourite but he dropped out and John won. – He was a chunky figure and what is said above about him not looking like a marathon runner is on the mark. His sheer white nylon shorts always seemed to be very tight and he had a stride length that was extremely short. The older guys in the Marathon Club said that initially, when he first took up road running, he always went with the leaders and inevitably fell back as the race progresses. However he went further with them every time out until he was with them all the way and eventually beating them. It was a real shock when we read in the ‘Daily Record’ or ‘Evening Times’ of his death. It saddened the whole road running community but he had been a great competitor, was well liked by all and his name is among the stars on the Donald McNab Robertson Trophy – between Gordon Eadie and Alistair Wood.